Chief Justice Irene Mambilima and deputy Chief Justice Marvin Mwanamwamba have directed all courts to search and review all documents submitted by Savenda Management Services and find anything that can lead to contempt of court. Mambilima and Mwanamwambwa want Savenda Management Service owner Mr. Clever Mpoha to be cited for contempt of court at any cost and are currently looking for charges to give him. 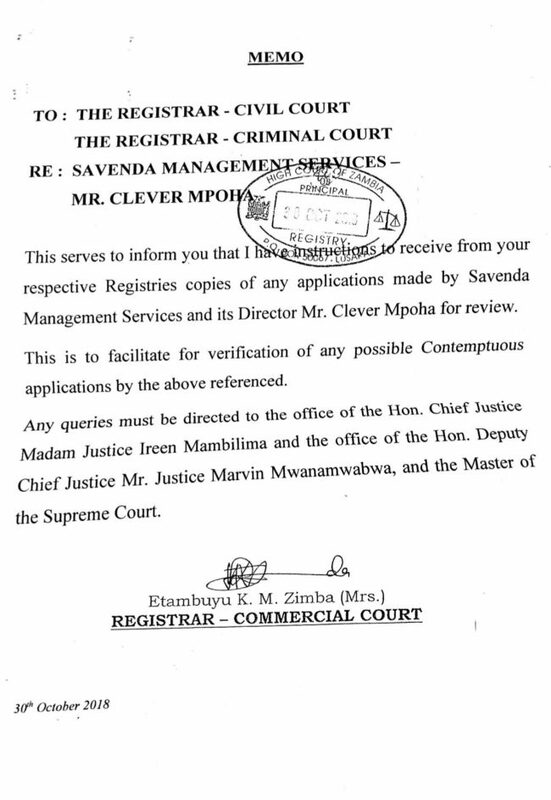 To that effect, Etambuyu Mwenda Zimba, the registrar of the commercial Court has written to the criminal and civil court registrars to give her all applications by Savenda so that she can see if there is anything she can use against Savenda on behalf of Mambilima and Mwanamwambwa. ‘This serves to inform you that I have instructions to receive from your respective registries copies of any applications made by Savenda Management Services and its director Mr. Clever Mpoha for review. This is to facilitate for verification of any possible contemptuous applications by the above referenced,’ Etambuyu Zimba wrote to other court officials. This is in the ongoing corruption scandal where Stanbic Bank Zambia bribed Supreme Court judges to trash a High Court judgment that ordered the bank to pay Savenda management K192.5 million. Stanbic appealed to the Court of Appeal which decided that the damage suffered by Savenda was only nominal, that is very small or existing in name only and awarded Savenda K5000. Savenda went to the Supreme Court, the last court. In March 2018, three Supreme Court judges Nigel Mutuna, Michael Musonda and Evans Hamaundu dismissed the appeal by Savenda. Surprisingly, the three judges did not just dismiss the appeal but instead decided to punish Savenda savagely. The Supreme Court ordered Savenda to pay Stanbic costs for all expenses the bank incurred from the High Court up to the Supreme court. The Supreme Court said Savenda did not suffer even nominal damages and that Stanbic did not breach any of its duties to Savenda. Though admitting that the matter was very important as it affects borrowers and lenders in Zambia, the Supreme Court said litigants like Savenda should not even be allowed in ‘our courts’. Then evidence emerged that the Supreme Court judges were biased and so aggressive against Savenda because they received bribes from Stanbic through the bank’s lawyer Eric Silwamba prompting a public outcry. The Supreme Court with funding from Stanbic then embarked on a crusade to silence anyone who questioned this corruption in the judiciary. Three people, Bishop John Mambo, Gregory Chifire and a journalist Derick Sinjela were summoned by the Supreme Court and charged with the crime of contempt of court. 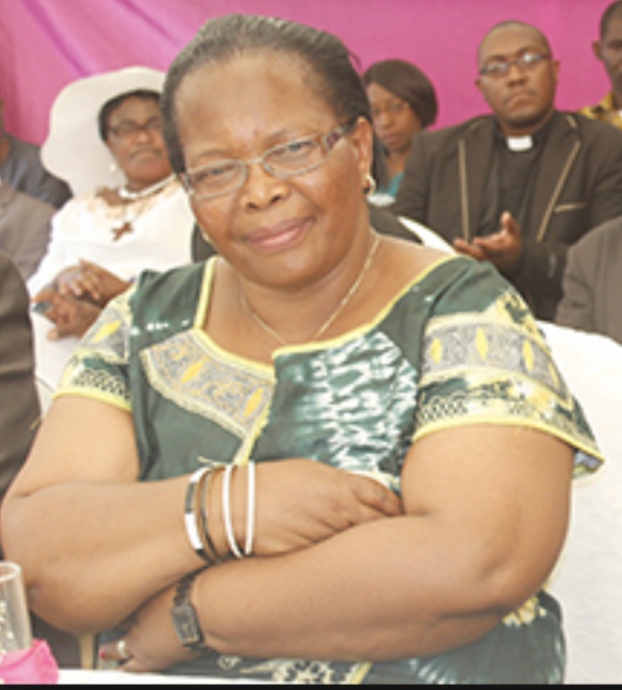 Bishop Mambo and Sinjela were forced to apology and admit guilty and are currently waiting to be sentenced. Chifire stood his ground and refused to surrender to the Kangaroo court. Now the Supreme Court wants to find a case against Savenda owners and will do anything to make sure they are arrested even on flimsy grounds. But this is surprising because the Supreme Court is supposed to be a neutral arbiter of disputes. But in this case, the Supreme Court has gone out of its way to fight battles for Stanbic. Now the judges were not bribed, why are they so determined to protect Stanbic by arresting innocent people. Now, if Savenda is not satisfied by the shoddy Supreme Court judgment and wants to make an application for the case to be heard by the full bench, will they look at it with justice or they will just be looking for something they can use against Savenda? It seems justice in Zambia is for those who can bribe judges. This is a shame on Chief Justice Mambilima. It’s a pity that the judiciary has lost credibility under her leadership. There has always been dirt in the judiciary but what Mambilima has brought is worse than sin.